﻿﻿﻿Native Americans found many uses for this prairie beauty. ﻿﻿﻿﻿﻿﻿﻿﻿My first encounter with a leadplant (Amorpha canescens), in the Chautauqua Hills of southeastern Kansas, came during the summer of 1992. For an undergraduate class at Stephen F. Austin State University, I needed to collect 400 herbarium specimens of the flora of Wilson County, Kan. I was very excited to document the flora of prairies, savannas and hardwood slope forests from the county where my family homesteaded in the late 1800s. Bumbling down a county road in my pickup, I braked at my first sight of the showy purple blooms and grayish foliage on a rocky, sloping tallgrass prairie. I encountered the majestic leadplant again when I returned to school, in a sandy upland longleaf pine savanna in the Angelina National Forest of deep East Texas. This began my fondness of the genus Amorpha and its several species that occur in a variety of landscapes in Texas. Amorpha, a genus of 16 species in the pea family (Fabaceae) with five species in Texas, is commonly called indigobush, false indigo, leadplant, prairie shoestrings and buffalo bellows. These perennial shrubs are often found growing in prairies, savannas and open bottomland woodlands, at the edge of open bogs and marshes and along streams. The name Amorpha is derived from the Greek word “deformed” because the flowers of this genus have only one petal, unlike the conventional “pea shaped” flowers in the pea family. Amorpha are shrubs that range from 1 to 16 feet tall and often form dense thickets. Plants develop a leggy nature with lower woody stems. Flowers are small and tubular in shape, blue to light to dark purple, with characteristic yellow stamens that usually extend beyond the single petal and are crowded in narrow spikes at or near the end of the branchlets. The tubular petals are folded around the stamens. Depending on the species, Amorpha flowers from April to July. Amorpha are important food sources to the larvae of several butterflies and are pollinated by many bee species. Lace bugs feed on the shrubs, and longhorn beetles bore through the stems. Several species of leaf beetles feed on the leaves. White-tailed deer sporadically browse on these shrubs. Native Americans used the leaves from leadplant in a tea to treat ailments such as pinworms, rheumatism, open wounds and cuts. Many Native Americans smoked leadplant leaves with buffalo fat and believed that buffalo were attracted to individuals who wore the leaves on their clothing. Some tribes named leadplant “buffalo bellows” because the flowering periods coincided with the time buffalo were in rut and bellowing. 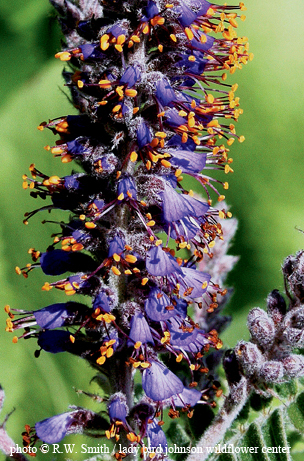 Leadplant is also sometimes called “prairie shoestring” because of the laced, shoestring appearance of the leaves. In Texas, leadplant is a shrub that grows to 3 feet tall and is a keystone indicator of high-quality prairie and savannas. Leadplant grows in the northern High Plains, blackland prairies, pine savannas in East Texas and coastal prairie in the Coastal Bend, where it is often found growing with little bluestem. With a deep tap root that averages 4 feet long and branching roots that can extend up to 15 feet, leadplant is resistant to fire and indicates well-managed lands with low to moderate grazing. Another species, false indigobush (Amorpha fruticosa), is widespread across Texas, except South Texas. False indigobush can be found at stream, pond, lake and marsh edges, where it forms dense thickets. Smooth indigobush (Amorpha laevigata) grows to 8 feet with characteristic smooth leaves, but is restricted to creek banks in far northeast Texas. Slightly shorter, the rare panicled indigobush (Amorpha paniculata) grows in open bottomlands and at the edge of bogs and marshes in eastern Texas. Texas indigobush (Amorpha roemeriana) is an endemic shrub (found nowhere else but Texas) in the Edwards Plateau, where it grows along perennial streams, juniper-oak woodlands and cliff faces. Find leadplant in the open sandy upland longleaf pine savannas of the Boykin Springs Campground area of the Angelina National Forest or on the driving loop at Aransas National Wildlife Refuge in the Coastal Bend. False indigobush can be viewed along the streams at the Gene Howe Wildlife Management Area and at Mineral Wells, Palmetto and Palo Duro Canyon state parks, to name a few. False indigobush is found along most perennial streams in the eastern two-thirds of Texas and can be viewed from bridge crossings. Texas indigobush can be viewed along the cliff faces from trails above Bull Creek in Austin.